In London, Glasgow, Leeds & Sheffield – Hear about Venezuela’s Alternative from Venezuelan Progressive Leaders! VENEZUELA SHOWS THERE IS AN ALTERNATIVE! Leeds Meeting, hosted by Y&HTUC – Venezuela & the New Latin America: Showing Another World Is Possible. Monday 3rd December, 5pm at the Regional TUC Offices, 3rd Floor, 33 Park Place Leeds, LS1 2RY. This speaking tour, including Latin America 2012 on Saturday, will look at how Venezuela is leading the way in showing there is a real alternative to the cuts & privatisation driving back living standards in Europe. Carlos Lopez, President of the Federation of University Workers & General Coordinator of the CBST (Bolivarian Workers Trade Union Organisation.) Carlos was also chair (on behalf of Venezuela’s unions) of the Commission which drafted the country’s new Labour Law, which is one of the most progressive of its kind in the world. 4) Leeds Meeting, hosted by Y&HTUC – Venezuela & the New Latin America: Showing Another World Is Possible. Monday 3rd December, 5pm at the Regional TUC Offices, 3rd Floor, 33 Park Place Leeds, LS1 2RY. Carlos & Jacobo will be speaking & answering questions. The event is free & light refreshments will be available. 5) Sheffield VSC Public Meeting – 21st Century Socialism: Venezuela shows another world is possible Tuesday, December 4, 7:00pm – 9:00pm, The Gallery Terrace, University of Sheffield Students’ Union, Western Bank, Sheffield, S10 2TG. The two speakers from Venezuela will address the meeting & take questions from the room. 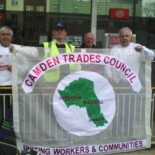 This entry was posted on November 28, 2012 by CAMDEN TRADES COUNCIL.